The idea that training is not “working out” is basic to me. I see the world as existing on a scale of 1-10. Each of us is somewhere on this continuum depending upon how we have chosen to live our lives and the challenges that we face along the way. The 80/20 rule (put in the work “up front” and it will pay dividends in the future) applies to the world of fitness just as it does in many other aspects of life. You have to be committed to a comprehensive exercise program (cardio, strength, flexibility and balance) in order to get results. The idea that we can spend 30 minutes/three days a week and get a positive result is ludicrous to me. The demands on our bodies grow as we age and the necessary outcome of this process is a weakened muscular/skeletal system and compromised cardiovascular capacity. The FITT principle and designing a program suitable to one’s goals is the beginning point for changing one’s circumstances and becoming truly fit. To examine your current potential for growth in the area of fitness, take into account ALL of the variables that make up your current life. 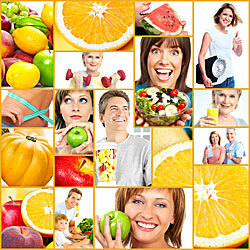 If you are on medications, have had surgeries, been dealing with a chronic disorder or medical condition (diabetes etc. ), or any other factor that may be of significance, then you must take them into account when planning your activities and developing your program. 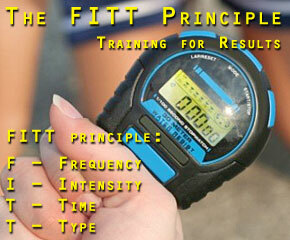 The FITT formula is used by trainers every day when developing a client’s fitness program. The letters stand for: Frequency, Intensity, Time, and Type. Examining your priorities and setting your goals appropriately helps you when designing your program’s parameters and MUST be constructed with RESULTS in mind so as to stay motivated and committed to your plan’s intention. Deciding what you CAN – and WILL – do is part of the planning process. I have NEVER asked anyone to do more than they are capable of doing in the beginning so accomplishments and milestones CAN be met with little disruption to individual growth and development. Doing TOO MUCH TO SOON is a very common reason for failure in the initial stages of any fitness program so it is wise to set realistic goals. RAMS is an acronym for reasonable, achievable, measurable, and specific so use this type of thinking when evaluating what it is you wish to accomplish in designing your fitness program and keep in mind we ALL come up short when learning new skills – be patient with yourself and you WILL succeed! Support and ongoing education are critical for success so keep your ears – and mind – open for new ideas and ways of doing things that interest you. If you begin a walking program learn more about walking and charting different courses for yourself. Challenge yourself periodically with an activity such as entering a 5k walk/run. It could prove to be beneficial in helping you stay motivated and engaged in your chosen activity – and be FUN TOO! This kind of decision can be supportive in moving us down the path to a new way of ‘living and being’ – leading to new and healthy behaviors. Remember, it takes 21 consecutive days in order to establish a new behavior so get going! Developing new skills is the most important element to consider when developing the overall plan so focus on becoming better in your chosen activity. Being comfortable with your program will allow you to continue without a lot of drama so be aware of changes that you notice when they occur. This will help you in becoming more flexible and adaptable to changing circumstances in your life and you can make appropriate adjustments when necessary. If, for example, you wanted to start your program with a frequency of 5 days per week and you have found that too challenging then dial back that variable to four days until you feel capable of handling the additional exercise load. Change one variable at a time and allow the change to take hold so that you can measure your progress. As a runner I might add a mile or two per week (over the course of a month) and see what happens or add an additional sprint session during the week to see how much progress I am making. Be careful to not revert to old patterns of thought and behavior in the early stages of your program so that you can give yourself a chance to experience the WHOLE program and ‘feel’ the changes as they occur. Obviously as in any programming where new knowledge and skills are required – BE PATIENT with yourself – and IF you are uncomfortable for a little while, it IS OK – it won’t kill you! Be open to change and IT WILL OCCUR over time! Deciding to embark on the journey of achieving a higher level of fitness in your life is a worthy goal worth all of your attention and energy – and creativity. It is YOUR life after all, isn’t it? It is the only one we will ever have so let’s do this with thought – and include proper perspective as well. Yes, it will require commitment, energy, and focus in order to be successful but the time and effort it will take will be well worth it. I believe we need to train more intelligently as we age and not just follow “the pack”. Every one of us is different with different needs and goals in life so let’s honor that aspect of ourselves as we move forward and just see what is possible. Give yourself a break and be patient – Rome wasn’t built in a day and your body won’t be reshaped in a day! I will discuss fitness in future articles as a way of helping AskTheTrainer.com expand its reach – and include nutrition as well. I am excited, are you?